King's Lynn based photographer working in the West Norfolk and North Norfolk areas. The web server used by Chrisholtphotographic.co.uk is located near the city of Ann Arbor, USA and is run by Merit Network. 40 other websites are located on this web server. Most of them are provided in the english language. 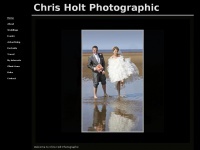 The websites of Chrisholtphotographic.co.uk are hosted by a Apache server and were developed in the programming language PHP. The markup language of the website is XHTML 1.0 Transitional. Due to the robot information on the webpage, the following actions by webcrawlers are not allowed: following the links and indexing the website. All other actions by webcrawlers are allowed.